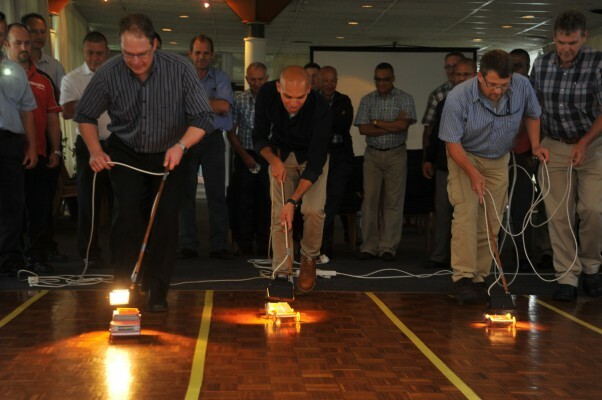 General Motors South Africa's (GMSA) engineers from the Product Engineering and Product Quality departments recently battled it out to see who can create the best solar powered vehicle. Working only with limited materials supplied from their managers, 14 teams set out to build a miniature car powered by a 1.5V electric motor and 0.75W solar panel. However, the engineers were allowed to apply mechanical modifications such as gearing, wheels or aerodynamics. While the engineers had two days to plan their project, on the day of the race they were allocated only 30 minutes to do final assembly and fine tuning. 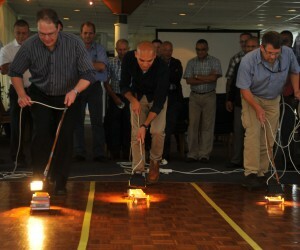 Since the event was held indoors it was decided to use 150 Watt spot lamps as a means to power the solar panels. The vehicles were judged for aesthetics, creativity and speed. "Give our engineers a challenge and they accept it with open arms," said Wendle Roberts, GM Africa vice president of Product Engineering. This project inspired teamwork and creativity added Roberts. "During the two days of planning there was a flurry of activity and excitement amongst the teams from various departments." Roberts said he was amazed at the quality and ingenuity of the final products. "This is also reflective of the teams' approach to developing and continuously improving engineering and technology on our locally produced products," said Roberts. At the end it was a difficult decision to make Team Chevy Stig won for its aesthetics while Team Solar Flare remained unbeaten in all three rounds of racing.